The official Game of Thrones video games were largely terrible. 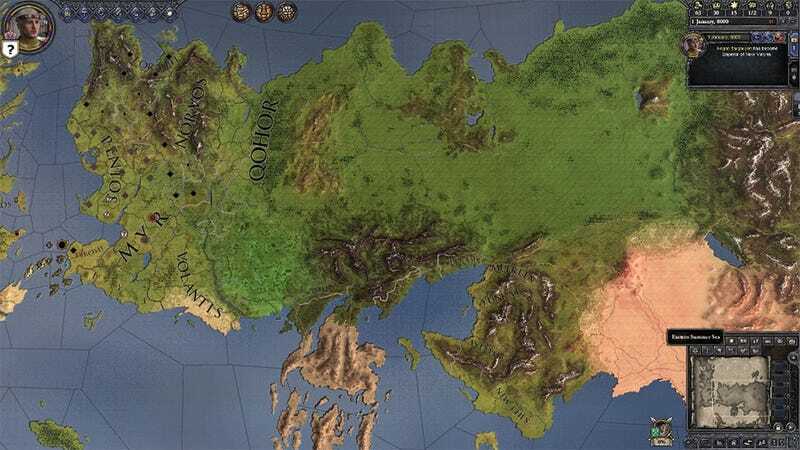 Lucky for us, then, that the Game of Thrones mod for Crusader Kings II is better than any official game could ever have been. Even luckier for us, that mod is about to get a whole lot better. The development team's April Fool's joke was that they were going to be adding Essos - the world's Eastern continent - to the game. It was funny, because it seemed too ambitious to be true. Nope. A month later and they've announced they're actually going to do it. It's still early days (much of the land is yet to be added as territory/factions), and the team faces a big challenge in that there's not as much canon for the East, so information on cities and dynasties is going to have to be fabricated in places. But still. The opportunity to take control of everything from Pike to Qarth is a tempting one, and the fact it'll be using CKII's Republic DLC as a base - which allows the Free Cities to be modelled somewhat accurately - is exciting.